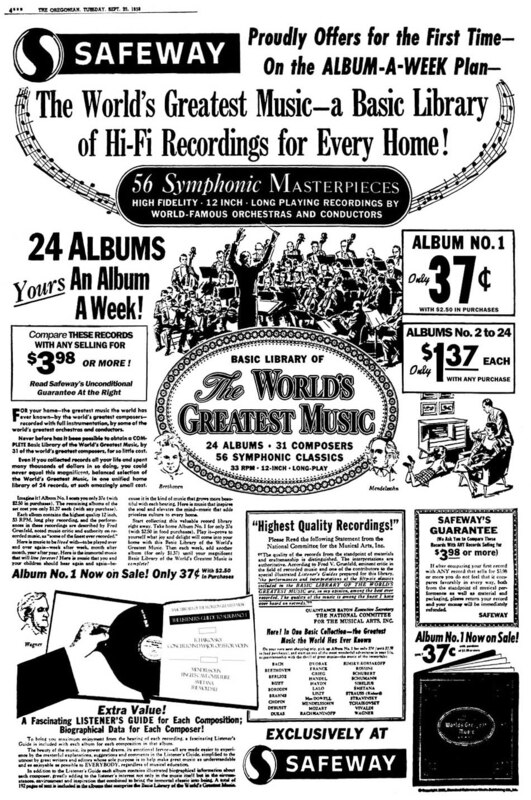 The "Basic Library of the World's Greatest Music", a vinyl record multi-album set, was introduced to the Kroger and Safeway grocery chains in 1958 by The Standard Reference Works Publishing Co. (which also published the similarly marketed "Funk & Wagnalls Encyclopedia"). 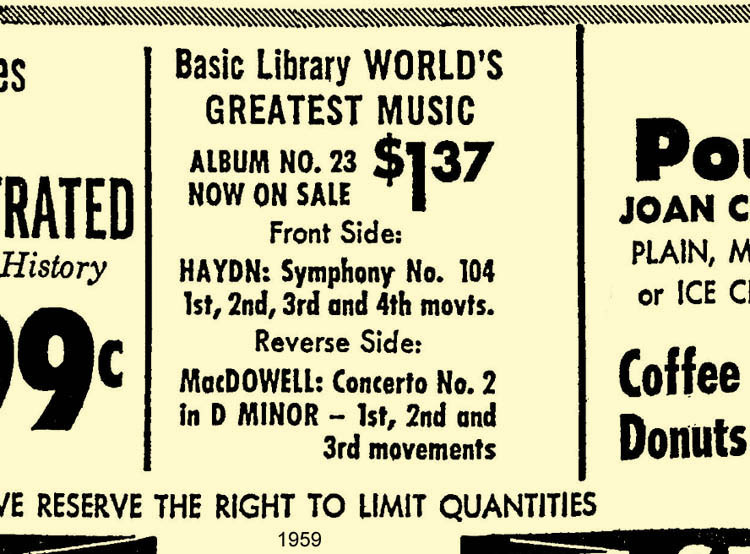 The Basic Library was sold one album per week, with the first album priced at 37¢ (cents), as a come-on to shoppers, with later albums priced at $1.37. The records were less than one-third of the price of those sold by the major record labels. It was produced under the "personal direction" of Joseph Laffan Morse, who edited the current version of the New F&W Encyclopedia. The Basic Library consisted of 24 records, sold in identical dark green cardboard albums. The records were 12" diameter, and recorded at 33⅓ rpm. Each album looked the same, except for the gold lettering of the album number and contents. It was assumed that these albums would be lined up on a shelf, like books, creating an impressive display in the home or office. There was an 8-page illustrated booklet glued to the inside of each album containing biographical information on the composers, as well as program information on the musical compositions. This booklet, the size of a record, was printed in black and a single half-toned color whose hue varied volume to volume. The grocery stores displayed the albums using a large floor-standing assembled wire rack with shelves, and decorated with colorful cardboard panels. The latest album, along with the previous weeks' unsold albums, were lined up on the shelves. The display was set up at the front of the store, or cross-wise at the end of an aisle. The news article on the right from 1958 explains why Kroger and Safeway sold the Basic Library and why A&P sold The Standard Treasury. 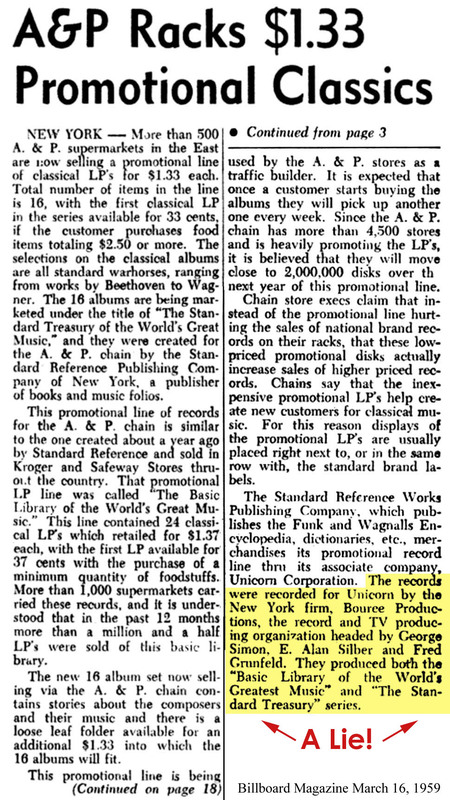 The two separate markets now explains why the two record sets came out the same year, 1958. The vinyl records were monophonic (single channel), not stereo. Stereo records had been introduced by 1958; and from 1958-63, many new recordings were issued in both mono and stereo versions. You had to be careful to purchase the correct version, they looked so much alike. A monophonic set was certainly acceptable at the time. The first album came with an 8½" x 11" 12-page booklet on "How To Use" the record set, extolling its virtues. Emphasis was placed upon the educational value of the set to the children of the family, and also on the opportunity for the family to listen together to entire concerts on 4 record sides. This gave them an inexpensive experience compared to attending a live concert. The entire album set cost less than $32, and that was spread over a 6 month interval. 24 RCA or Columbia retail records would have cost $108.00. In 1959, a gallon of gas cost 25¢, a movie ticket was $1.00, and a loaf of bread was 20¢. So a 24 record retail set would be equivalent to 540 loaves of bread, that's a lot of "bread"! Many consumers did not even live in an area served by a professional symphony orchestra, for example, in farming communities. High School and College Orchestras were available to most anyone. But these record sets offered an opportunity for everyone to experience high culture at low cost, allowing repeated listening any time, and learning about the composers and their works. Three pages of the booklet were devoted to endorsements by leading educators of the time. The last two pages contained a complete list of the recordings by album, along with the composers' names. The booklet had a full-color cover showing a family of four pouring over one of the albums. This was pretty good salesmanship for the times. These two records sets did not sell well in the major cities, with lots of musical arts available, more discriminating hi-fi enthusiasts, and more retail record stores. They did sell very well in small cities, towns, and rural areas; this was the mother-lode of aspiring culture, and limited funds. I would not have expected the "Basic Library of the World's Greatest Music" to sell as well as "The Standard Treasury of the World's Great Music". Let's examine the design and marketing of the Basic Library album set, and see why this might be. The 12 page "How To.." booklet which came with the first record was of deluxe quality, and was certainly helped to sell the records, encouraging you to get an entire set, which was the goal of the marketing. But, it was expensive to produce, with full color and stapling. Included with each record was a small teaser sheet that detailed the music on the next record in the series. This was sometimes double-sided. The fact that all of the albums were identical with no outside photos made them boring to look at, rather than attention-getting. It was easy for the consumer to justify purchasing only a few records that were of interest, because they were individual. Your bookshelf would look almost as good with 12 records, as with 24. Having 24 albums was a bit of a strain for a consumer sales campaign. The sale of a complete set took 6 months! Whew! Long works were cleverly organized to continue onto the next record, rather than the opposite side, which would have required stopping the record changer and flipping the record over manually. With a record changer, which was very common at that time, you could place either 4 or 8 records on the changer and get a long performance of several orchestral works, just as at a live concert. You could not do this with major label records. 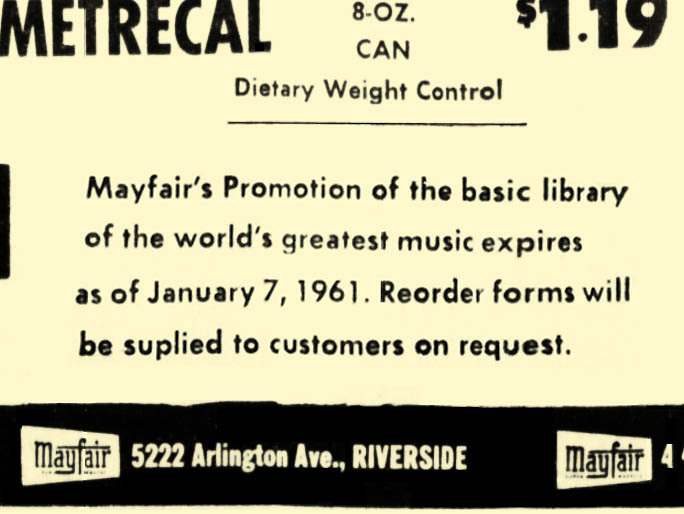 The fact that you typically had to purchase at least a pair of sequential records to get complete works, and the long concert times, also increased sales. The booklets in each album were called "Listener Guides", and were well written and simply illustrated with sketches and paintings of the time when each composer lived. The critics and elite buyers looked down upon these record sets for their low price, the fact that they were purchased where you bought lard and bleach, and the fact that the artists identities were unknown. Also, because you could not select a particular conductor, orchestra, or soloist, they were not reviewed by critics, and worst of all, not in the authoritative Schwann catalog! But as we shall see in the section on the sources of the music, this attitude is not justified, as many of these performances were truly fine, by excellent orchestras, conductors, and soloists. The quality of the records was perhaps not the very best, but certainly average compared to major labels. Even after 60 years, my set, whose records have been carefully cleaned, and cherry-picked from several sets, play with low noise and very "high-fidelity" sound. See our web page Improving Sound to find out how to make these record sets sound almost as good as CDs. Click the Button for the Main Page on the Basic Library of the World's Greatest Music, which at the bottom, gives information on the 1985 re-issue of the music on Cassette and CD. 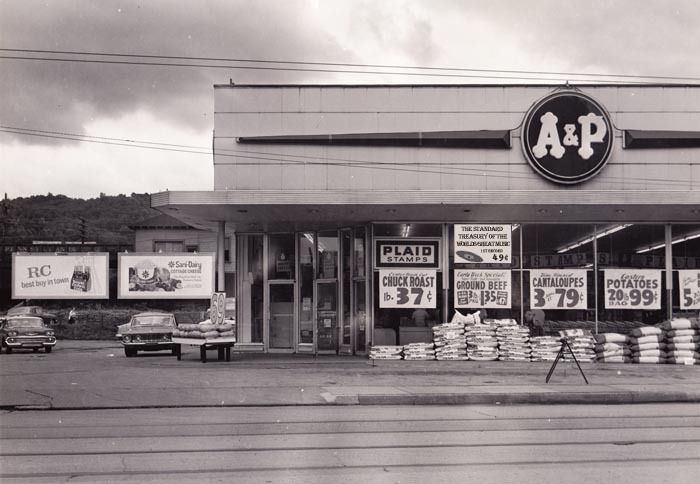 The same year, 1958, they offered The Standard Treasury set to A&P, which I think had improved marketing. These were the same recordings, by the same unstated musicians. The records were 33¢ for the first and $1.33 for the rest; the required additional binding kit was also $1.33. A side note, I have recently seen a newspaper ad from December, 1962, in which a department store in Kansas offered the set, one record per week, The price of record #1 was 29¢, and the other records were 99¢, with the album at $1.39. The total price of this set would have been $16.53, a true bargain! The 16 records were designed to fit in a single large album purchased at the end of the campaign. The album had hard cardboard boards (covers), and an embossed "Moroccan" fake leather paper covering, of a dark red color with gold lettering, and gold and black detail. The album looked pretty elegant when new, but was not designed for significant wear and use. You often see them on eBay without covers, and the prices can be a little unreasonable. But it is possible to get a good condition album, with very little wear on the vinyl. It is a fact that many people who bought the set didn't really listen to the records much. In fact, I have purchased individual records from this set on eBay still sealed in the original plastic covers, as they were sold in the store. The disadvantage of The Standard Treasury is that it was large and unwieldly, especially for children. There was a complete and bound set of the 16 records front and center in the display rack, so the shopper could see the final product that they would have at the end. This was very impressive to see, along with the colorful covers of the latest album, and the previous albums. Each week's record was packaged with a beautiful full-color picture, similar to those of the major record companies' album covers. These pictures actually were well thought out to catch the consumers eye with color and exotic locations in Europe. They often related well to specific works on that particular record. The clear plastic packaging had the booklet behind the front cover, followed by the record in it's paper sleeve. This sleeve is unusual in that it is made from a very soft fibrous paper that helped prevent scratching. There were big holes to match up with the record label, and this let dust in; but there was also a flap at the top to keep dust out when the album was stored vertically. This made the weekly set of different records on the wire rack look very colorful, and eye-catching. The pictures made you want to hear the music that went with them. Having a single binder, purchased with the last record made it more attractive to purchase all 16 records. You wouldn't want an half-empty album. 16 records is also a shorter campaign of 4 months compared to 6 months for the Basic Library. The brochure that came with the first record was much simpler than the earlier booklet. It was a two color fold-out that was less expensive to produce, and still probably was effective. As with the Basic Library, there was a small teaser sheet that detailed the music on the next record in the series. I think that the changes made to the Standard Treasury were smart and effective, compared to the Basic Library. But both sets sold well. The run of both sets was from 1958 to 1962, when most records being sold were in stereo, not mono. See the Full Page Safeway Ad Below from The Oregonian, Portland, Oregon's Major Newspaper, September 23, 1958 !